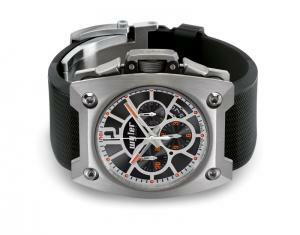 Geneva, 13th January 2009 – Ahead of this year’s Baselworld show, Swiss luxury watchmaker Wyler Genève presents a new version of its Code-R chronograph. The watch in brushed titanium features the brand’s familiar shock-absorbing case but with a distinctive new dial design. The large Wyler Genève shock-absorbing case measures 52.10mm by 43.50mm and has been baptised Code-R to encompass all collections for which it is used. In this latest incarnation, the Code-R case is finished in brushed titanium with brushed titanium pushers and crown protector and a rubber-coated titanium crown. Four sprung-mounted titanium screws at the corners of the case fix the sandwich construction of titanium plates, carbon fibre frame and titanium container together to provide the shock-absorbing function and are polished to single them out as functional – rather than purely aesthetic – elements. Recalling the brand’s popular El Camino Real model, the dial of this chronograph features a one-piece applique that comprises the rings for the continuous seconds and chronograph counters, 11 integrated hour markers and an over-sized Arabic 12 in the appropriate position. This rhodium-plated element has a sunbrushed finish that contrasts with the black dial, with orange SuperLuminova dots used for the hours. Brushed rhodium-plated skeleton hands with orange SuperLuminova tips complete the look. A sectorial date window at 4.30 indicates the day’s date with the previous and following dates visible to avoid any confusion when the date is changing. This new model is powered by a self-winding Swiss-made chronograph movement, which has a power reserve of 42 hours when fully wound. The automatic winding is assured by Wyler Genève’s personalised oscillating mass in drilled blackened heavy metal with white Wyler Genève inscription, visible behind a transparent sapphire crystal window in the case back. The movement, suspended in a sealed titanium container, is guaranteed water resistant to 50 metres. The watch is fitted as standard with a black rubber bracelet with pushbutton-operated foldover clasp in steel and titanium. As with all Wyler Genève models, it comes with a 2-year warranty.